See the town of Sintra’s captivating Romanticism architecture, the beauty of the Estoril Coast, and explore the rich heritage of Lisbon on this privately guided tour from Lisbon. 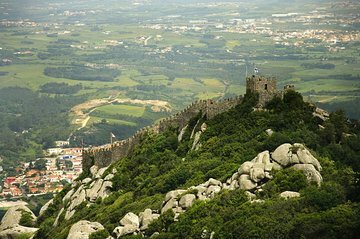 On this tour, you will visit UNESCO-listed Sintra and marvel at its fairytale castles set upon hillsides. Spend time glimpsing over the stunning golden beaches of the Estoril coast and immerse yourself in the lively capital of Lisbon. It’s the most comprehensive tour covering the top sites and landmarks. Plus, with your private guide, you can enjoy an experience tailored to you. Meet your guide at your Lisbon hotel and begin your private tour with a drive to the UNESCO World Heritage-listed town of Sintra. Arrive in Sintra and take a stroll through the slender corridors of this charming town. Then, visit the Pena National Palace and admire its colorful and eclectic architecture built in the Romantist-style. Listen as your guide tells the story of King Ferdinand who commissioned its build in the 19th century. Next, take a serene drive to the banks of the Estoril Coast towards the lovely town of Cascais. Rich with fishing tradition, see how this cute town preserves its past heritage. Then, take a leisurely drive to the rocky shoreline of the Estoril Coast. Discover spectacular golden beaches and glimpse over the vibrant Atlantic Ocean. From here, return to Lisbon to enjoy an afternoon soaking up its historical squares and famous monuments. Start by heading to the commanding Castle of Saint George which sits atop the tallest hill in Lisbon. Capture panoramic views of the old Moorish district of Alfama while you gaze out towards the Tagus River. Continue down the hill to Lisbon’s famous district of Belém and learn about its important role in Portugal’s navigation and discovery history. In Belém, hear about Lisbon’s colonial roots as the capital city of an empire that once controlled half the world. See the Monument to the Discoveries, and hear about its construction in 1960 to commemorate 500 years since the passing of Henry the Navigator. Then, stroll to the UNESCO-listed Jerónimos Monastery and the 16th century Tower of Belém. Learn how these monuments honor the Portuguese explorers who crossed oceans to discover new lands. Afterward, return to your Lisbon hotel. Wonderful! Wonderful! Wonderful! I loved the places, the guide and the pace. It was well planned. Our tour guide Sarah was amazing and very knowledgeable on the historical background of the places that we visited. She was friendly and accommodative. Our guide was excellent. Went out of his way to make our day exceptional in every way. Highly recommend him for quality, knowledge, personality and. friendliness. One of the best guides we have ever had. Would rate this tour guide 5 stars plus! Excellent tour with a great tour guide. Weather was not the best but still great. Way too much money for what we received. We even had to pay our admission into the sites which I assumed was part of the tour. The day before we booked a tour through our hotel which was basically the same thing we got through you for $80Euro per person compared to 209 with you. I had used this service in San Fransisco and was so satisfied but this was Ridiculous!!!! Outstanding guide , Louisa , and wonderful tour!!!!! she was really superior and we have traveled all over the world! We loved our tour guide. He was very knowledgeable about the all the sites and history. Next time we travel to Europe we will definitly use Viatour again.